Global climate change and energy are integrally related. The majority of greenhouse gas emissions are the result of energy production and use; at the same time, warming will affect energy patterns in California through physical increases in energy demand, physical changes in energy supply, and changes in both energy end-use patterns and supplies resulting from climate-change policies. In 1988 the California Energy Commission, with the help of six other state agencies and the University, began a serious inquiry into the impacts of climate change on California. This inquiry included an analysis of both energy demand and supply impacts. The Commission used its end-use demand forecasting model to project how energy demand would change by the year 2050 from a three-degree Celsius warming. Along with the State Department of Water Resources, the Commission analyzed changes in energy supply that could result from the same-magnitude warming. The findings of the study, which are presented in the sections below, show that climate warming could increase energy demand while reducing energy supply. There seems to be a growing political consensus that the world (as well as the state) needs to act soon to minimize further commitment to future warming. While California is not likely to experience the physical changes resulting from a warmer climate for years or perhaps decades, policy responses to the warming issue may cause more immediate impacts. This chapter will discuss how policy response to potential warming may be the most significant early impact of the issue on California's energy system. Makers of energy policy face the dilemma of deciding how to respond to the climate warming issue in the face of scientific uncertainties about its timing and seriousness. The chapter will conclude by presenting a conceptual framework for dealing with this dilemma, along with general recommendations for action. Higher temperatures are expected to increase energy demand. An effective doubling of CO2 (expected to occur sometime between the years 2030 and 2070) would increase the annual average temperature of the state by two to four degrees Celsius (C). As a result, there may be some decreases in winter heating requirements; but because much of California's population resides in warm regions, increases in summer air-conditioning loads would far exceed any decreases in heating load. According to the California Energy Commission, changes in heating and air conditioning from a three-degree C increase in average temperature in the year 2050 would increase peak demand by 3 to 7 percent and overall energy demand by 1.5 to 2.5 percent, assuming no significant change in population (Edwards et al. 1989). Air-conditioning loads would markedly increase in agriculture and industry as well as in residential and commercial buildings. There would, for example, be an increased need for cooling poultry operations during the warm season, and more energy would be required to chill and freeze food products. Industrial, commercial, and residential buildings would require cooling to make them workable and livable. Water pumping would account for another major source of increased energy demand. As California's climate warms, the state's supply of surface water is expected to decrease owing to both decreases in snow-pack storage and increased evaporation. At the same time, higher temperatures during growing seasons will increase irrigation water needs for most crops. With traditional water supplies declining and water needs rising, the state will have to rely on additional energy-consuming groundwater pumping to help fill shortfalls. In addition, some of the water conservation methods available to farmers require replacing current open irrigation systems with enclosed systems, which also require more energy for pumping. Agricultural energy demand, of which water pumping is the major component, is currently responsible for about 8 percent of energy demand in the PG&E utility service area (Jaski et al. 1989). Statewide, the Energy Commission estimates that, with a one-degree warming by the year 2010, electricity demand for water pumping could increase by about 1 percent (Baxter and Calandri 1989), and it is expected that this demand will continue to increase well into next century as the climate warms. Many agricultural operations may eventually face the decision of whether to remain in an area where water and energy costs are increasing, or move their operations (where possible) and contend with higher transportation costs. Several physical changes in energy supply would result from a global climate warming: changes in hydroelectric generation, in the efficiency of conventional fossil-fueled power plants, and in renewable energy resources. Changes in watershed runoff would directly affect hydroelectric generation. While there is no consensus on whether climate warming will increase or decrease annual precipitation, scientists generally agree that it will decrease snowpack storage in the state's mountain watersheds. As a result, more water will flow in rivers during winter and less during the summer; overall, however, less water will be available for power generation. For example, estimates suggest that in the Feather River Basin a three-degree warming would reduce hydroelectric capacity and energy production by up to 7 percent (Edwards et al. 1989). In addition, less hydroelectric power would be available when it is most needed, during the state's summertime peak demand periods. Increasing competition for water brought on by lower supplies and increased agricultural and urban demand, and needs to protect natural habitat, may further reduce hydroelectric output. California already experiences periods of significant competition for available water, particularly during low rainfall years. Because the state has many other sources of power, hydrogeneration is sometimes reduced in order to release more water for downstream uses. This trend may intensify as the climate warms. Warmer ambient temperatures, as would be expected from a climate warming, may reduce the efficiency of power plant cooling systems, resulting in lower net electricity output from many thermal-electric generating plants. Most fossil-fueled, geothermal, and nuclear power plants use water cooling systems to lower the pressure of steam turbine exhausts; since the electricity output of these plants is partly a function of the difference between their turbines' intake and exhaust pressures, a decrease in exhaust cooling efficiency will reduce their output. For example, the North American Electric Reliability Council estimated that during the hot summer of 1988 the United States lost seventeen thousand megawatts thermal capacity as a result of the high temperatures and constraints on cooling water (Energy Economist 1988). The picture on renewable energy resources is mixed. Whereas climate warming would reduce output from conventional generating plants, it may increase output from some renewable sources. Some data have suggested that warming-induced changes in California offshore ocean currents will intensify the summertime wind regimes that drive most of California's wind turbines. This could increase power output at existing sites and allow currently submarginal sites to be commercially developed. Warming might also increase the near-term availability of biomass fuel. Carbon dioxide fertilization could well increase the volume of agricultural residues available for fuel. Changes in the ranges of forest species might also result in the die-off of large numbers of trees, parts or all of which could be salvaged for fuel. However, these same changes in forest composition would lead in the long run to a decline in forest biomass. For example, the EPA estimates that the western slope of the Sierras could ultimately have only 60 percent of current biomass as a result of a CO2 doubling (Smith and Tirpak 1988). As described above, the physical impacts of global warming will have a significant, though not devastating, effect on California's energy demand and supply. The impacts in other areas—agriculture, water resources, natural ecosystems, forestry, human health, and the overall economy—may be much more intense than those on energy systems. All these impacts should be intermittent and mild in the near term but would intensify over the next several decades. Californians need to recognize that policies to minimize long-term warming, whether they originate from federal or state government, may have a much more immediate impact on the state than the warming itself. The following discussion identifies some of the most likely policy actions and their near-term implications. One policy proposal with potentially widespread impacts is a fee on fossil carbon emissions (a carbon ìtaxî). Currently discussed primarily in the context of a national or international policy, this fee would have two purposes: First, to account for global warming-related externalities associated with the use of fossil fuels. In this context, the fee would provide the most benefits if the revenues collected were used to prevent and mitigate the warming. Second, the fee would be an incentive to reduce consumption of fossil fuels. If applied to the major fossil fuels (coal, oil, and natural gas), the fee would affect virtually every aspect of the state's economy. Gasoline and diesel fuel prices would rise. Electricity generated from natural gas (43 percent of California in-state generation) and coal (most of the electricity imported into the state) (California Energy Commission 1989b) would become more expensive. Fertilizer produced by using natural gas would cost more. Even the price of steel used in imported products like automobiles and refrigerators would go up. Eventually, the cost of most goods would rise, and purchasing habits of businesses and consumers could radically change. Such a carbon tax would encourage consumers to make fuel-use decisions with more complete knowledge of costs, including currently hidden environmental costs. Most analysts assume that such a tax would reduce overall fuel consumption and, in turn, CO2 emissions. (Estimates on the amount of reduction for any particular tax level vary widely.) Those reductions would likely come as consumers both increase the efficiency of their energy use (by applying technological improvements) and curtail their fuel-using activities. Thus, while a carbon tax could (depending on how high it is set) lead to increased social efficiency, it would likely have a noticeable affect on the lives of Californians. But even though a tax might raise direct energy costs in the near term, it could increase overall energy efficiency to the point where the cost of services provided by using fossil fuels (moving people from one place to another, raising food, heating and lighting buildings, for example) would go down. The most significant proposals for a carbon tax are currently being discussed at the national and international level rather than as a state tax. While a widely mandated tax would be more effective in reducing overall carbon emissions, even a unilaterally applied state tax could be beneficial if it were no higher than carbon combustion externalities and the tax revenues were used to reduce CO2 emissions or to mitigate the damage they cause. Improving energy efficiency is probably the most promising approach to reducing fossil carbon emissions. There are ample data showing that government policies reduced, or at least stabilized, fossil-fuel consumption from the mid-1970s to mid-1980s. In California, for instance, state-mandated appliance and building efficiency standards have saved over ten thousand gigawatt hours of electricity and a billion therms of natural gas since their introduction in 1977 (California Energy Commission 1988). Federal corporate average fleet economy standards (CAFE) have increased the average fuel efficiency of new cars sold in the United States from fourteen miles per gallon in 1974 to the current twenty-eight miles per gallon (California Energy Commission 1989a). The consensus among both environmental and energy analysts is that more aggressive energy efficiency policies could dramatically reduce energy consumption and, in turn, fossil-fuel carbon emissions. While estimates vary, cost-effective efficiency improvements might, at minimum, stabilize fossil-fuel emissions at current levels and may, if more optimistic estimates are true, allow cutting current emissions by up to 75 percent. Cost-efficient measures would result in a net benefit to society—reducing costs while providing the same energy service; this does not mean, however, that particular companies and individuals might not suffer. There is some indication, for example, that the current modest oversupply of generating resources is raising California's per-unit electricity rates (customers are paying for underutilized capital equipment). Increased energy efficiency might exacerbate this problem for a short period. However, most electricity users who aggressively apply energy efficiency measures will see their utility bills decrease, even if the rate per KWH is higher. In the long run, by avoiding construction of new, costly power plants the total costs of the system should decline. Another promising option for reducing carbon emissions is substitution of renewable energy resources for fossil-fueled electric generating plants. California currently has over ten thousand megawatts of renewable generation in operation (including hydroelectric, geothermal, biomass, wind, and solar technologies) producing electricity with little or no net carbon emissions. Many of the renewable technologies have the technical maturity efficiently to displace additional fossil-fueled generation, but most currently produce electricity at a higher direct cost. However, when all the external costs of fossil-fueled plants—indirect costs to society such as government subsidies, energy security, and pollution—are accounted for, renewable resources may turn out to be more cost-effective than fossil-fueled generation. Thus, while a shift to renewable technologies may raise the direct cost of electricity, it may lower the overall societal costs of electricity generation. According to some scientists, it may be possible to reduce atmospheric concentrations of CO2 by sequestering carbon. The primary methods being considered rely on trees to take up and store carbon: reforestation and afforestation, and more intense management of existing commercial forests. There is also some discussion of removing CO2 from powerplant emissions and storing it in deep ocean areas, but high costs and technical difficulties currently preclude this approach from serious consideration. In California, extensive areas of currently marginal, rural land could be planted with fast-growing tree species. Large, irrigated tree plantations may not be practical since they could exacerbate competition for scarce water. But there is a significant opportunity for planting drought-tolerant trees in currently unused or underused land. Planting trees in many urban areas would have the dual benefit of sequestering carbon and providing cooling shade to reduce air-conditioning energy consumption. In addition, much of the state's commercial forest land, particularly many of the smaller parcels in absentee ownership, could be more intensively managed to increase substantially the land's productivity and its standing volume of carbon material. Careful consideration must precede decisions about the kinds of trees that are planted, however. Certain varieties of trees naturally emit substantial amounts of reactive hydrocarbons. For example, approximately one-half of the reactive hydrocarbons in the air over Atlanta, Georgia, come from tree emissions. Since these hydrocarbons can be precursors to photochemical smog, planting trees with high hydrocarbon emissions in urban areas could exacerbate local air-pollution problems. In sum, it is important to recognize that policies designed to prevent global warming and its adverse impacts may themselves have negative impacts. It is critical to design policies that effectively reduce greenhouse gas concentrations with a minimum of other adverse consequences. The possibility of greenhouse warming presents California and the rest of the world with a plethora of problems. It also raises an overarching policy dilemma: while government should act to protect its citizens from the impacts of global warming, uncertainties inherent in the greenhouse issue make it difficult to justify instituting policies that themselves would have dramatic consequences on the economy and course of society. There are three arguments to consider in dealing with this dilemma: First, many of the policies that will help prevent future warming can be justified for other reasons. For example, reduction of automobile, power-plant, and thermal-boiler emissions is already a main strategy for overcoming the staggering air-quality problems that plague California's urban areas. Further, measures that reduce petroleum use also reduce the state's vulnerability to the kind of shocks in oil prices and supplies experienced in the 1970s. Thus, increasing energy efficiency and switching to nonpolluting alternative power sources would bring immediate benefits to the state even without considering the issue of global warming (see table 1). Note 1: Tree plantations could become an ongoing source of biomass fuel while, as a whole, remaining a sump for carbon. Back. Second, Western society in general, and specifically California, has a tradition of insuring itself against potential events with drastic consequences. Even with a relatively small chance of disaster occurring, essentially every building of value in the state is insured for fire loss. The state's flood protection system has likewise cost billions of dollars. Yet the likelihood of a fire destroying any particular building during its useful life is very small; and there is only a fifty-fifty chance we will have a hundred-year flood during the next century. There seems to be a consensus among scientists that we face even odds of a substantial global warming during the next century, yet this threat has not elicited a response similar to those established for fire and flood. Part of the problem is that policymakers have seen the consequences of fires and floods but have not seen the consequences of a three-degree C warming. Yet if society is willing to trust its scientists in such potentially far-reaching matters as, say, genetic engineering or nuclear waste storage, should it not also recognize their warnings on global climate change? Third, it is time for policymakers to start considering a broad range of issues related to the general topic of economic sustainability. Here sustainability refers to the natural resources (material inputs as well as the ability to absorb economic outputs like pollutants) that allow continuing any particular economic activity indefinitely into the future. Government presently seems to give little thought to the level of economic activity that can be sustained over the long term. But the threat of global warming dramatically illustrates that current trends in the use of global natural resources cannot continue indefinitely. And future warming is only one of many similar problems. It is clear, for example, that California's agriculture faces serious problems—for example, salinization and pesticide residues—that are independent of global warming but may equally threaten the state's agricultural productivity. California, along with the rest of the world, faces persistent and growing problems of pollution and resource depletion. The environmental community and increasingly the business community agree that problems of environmental sustainability must be solved before they radically change the structure of our economy and society. Will we make a gradual transition to economic institutions that can be sustained, or will we continue with our current trends and wait for devastating changes to ravage the economy? Policymakers must recognize that resource and environmental issues will affect California's future in any event. They have an obligation to work toward a gradual rather than a radical transition. Does this mean that people must accept a lower standard of living? Not necessarily. Today's standard is now generally measured by the per capita value of all goods and services, but these measures do not necessarily recognize the value of improved efficiency; nor do they recognize the myriad nonmarket factors that affect people's lives. In short, we are using inadequate means to measure economic and social well-being. With more realistic measures of economic well-being and with a strong sense of the importance of economic sutainability, policymakers can begin the arduous task of establishing new policies to deal with sustainability issues. The time is now. Conduct research to assess the full- and long-term social costs of greenhouse gas emissions. Expand research to evaluate the impact of future energy-cost changes on key economic activities within the state. Establish greenhouse gas emission reduction goals for California that will help achieve long-term energy and economic sustainability. Expand statewide programs to reduce energy demand and increase supply while still providing necessary energy-related services. Expand programs that encourage cost-effective water management, including increasing water-use efficiency and water-storage capabilities. Expand research to evaluate the opportunities for replacing fossil fuels with renewable biofuels. 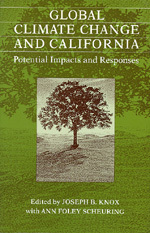 Expand research on the tree species and management techniques most appropriate for sequestering carbon in California. This research should emphasize forest management and reforestation systems as well as tree species that maximize carbon storage, optimize the production of usable fiber, and minimize atmospheric emissions of reactive hydrocarbons. Initiate research on the effects of state government policies on the economic and environmental sustainability of the state. Baxter, Lester W., and Kevin Calandri. 1989. The effects of global warming on electricity use in California. Paper presented at 9th Miami International Congress on Energy and the Environment, December 1989. California Energy Commission. 1988. Biennial conservation report. October. Sacramento: California Energy Commission. _____. 1989a. Biennial fuels report. November. Sacramento: California Energy Commission. _____. 1989b. California's energy agenda: The 1989 biennial report. July. Sacramento: California Energy Commission. Edwards, Allen G., et al. 1989. The impacts of global warming on California. Sacramento: California Energy Commission. Jaski, Mike, et al. 1989. California energy demand 1989-2009. December. Sacramento: California Energy Commission. Smith, Joel B., and Dennis A. Tirpak, eds. 1988. The potential effects of global climate change on the United States: Draft: Report to Congress. October. Washington, D.C.: U.S. Environmental Protection Agency. California's extraordinary ecological and economic diversity has brought it prosperity, pollution, and overpopulation. These factors and the state's national and international ties make California an essential test case for the impact of global climate change—temperature increases, water shortages, more ultraviolet radiation. The scientists in this forward-looking volume give their best estimates of what the future holds. Beginning with an overview by Joseph Knox, the book discusses the greenhouse effect, the latest climate modeling capabilities, the implications of climate change for water resources, agriculture, biological ecosystems, human behavior, and energy. The warning inherent in a scenario of unchecked population growth and energy use in California applies to residents of the entire planet. The sobering conclusions related here include recommendations for research that will help us all prepare for potential climate change. Joseph B. Knox, division leader of atmospheric and geophysical sciences at Lawrence Livermore National Laboratory, is Director of the National Institute for Global Environmental Change in Davis, California. Ann Foley Scheuring is a professional editor and writer affiliated with the University of California, Davis.